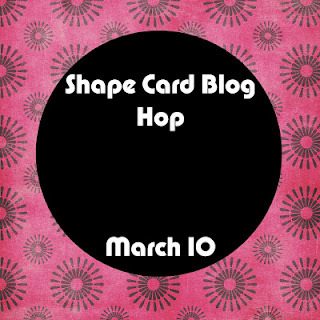 CardMonkey's Paper Jungle: Cards: All shapes, all sizes: Welcome to the Shape Card Blog Hop, March 10! 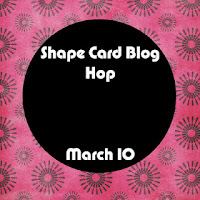 Cards: All shapes, all sizes: Welcome to the Shape Card Blog Hop, March 10! Round, oval, square, rectangle, triangle .... tea pot, coffee cup, dog house ... all are shapes that we're called on to explore in Ashley's "Shaped Card Blog Hop," happening today in the Blogosphere. For my card today, I chose egg-shaped, in preparation of Easter. An egg-shape is not fully oval as the top of the oval is narrower thanthe bottom. Getting cuts to line up to weld has always been a challenge I've not yet mastered on my Cricut/Gypsy. But, with the advent of the fabulous Cricut cartridge "Art Philosophy", sold exclusively by your Close to My Heart representative, mastering the art of shaped cards has never been easier. Using the "card" setting on the Art Philosphy cartridge, I cut a yellow conjoined egg shape in 4.75", and topped it with the single cut layer (cut in light blue) in the "Decorative layer" setting. I cut a second Decorative layer in polka dotted paper, using the off-cuts to fill the top and bottom scalloped area. The bunny with flowers is a newly released digital stamp by Whimsy Stamps. I colored it using both Prisma pencils and Copic markers, highlighting areas with a white Gelly pen. I blended the pencil lines using a blending tool and Gamsol. I accented areas (e.g., the tail, leaf cuts and dots) with Stardust Stickles. The inside sentiment is a simple "Happy Easter" stamp from Hero Arts. If you've missed any part of the Hop, please start at the beginning: Ashley's "The Glamorous Side of Scrapping." There, you can see what blog candy is being offered by some fabulous sponsors, and you can catch the whole line-up for today's hop. Thank you again for joining me in the PaperJungle! Love, love, love this stinking cute card! I bet lil Charlotte will be so excited this Easter! Thanks for the awesome intro to my stop ....but whew, how do I follow such talent? Big shoes to fill, my friend. Hugs, you're the best! Such a super adorable card Ellen!! Love the Easter egg shape and the adorable bunny! What an adorable Card! I love the Egg Shape & Your image is so cute & I love how you colored it! Glad to be in this hop with you! What a pretty cards. Guess I will be checking out the card feature on some of my carts. Love your card. Thanks for sharing it. I love your adorable Easter Egg shaped card. I love the coloring you did on the stamped image. Thanks so much for sharing. Very sweet card, love the little bunny! It's been nice hopping with you! This is such a cute Easter card. I just ordered Art Philosophy. I can't wait for it to arrive. 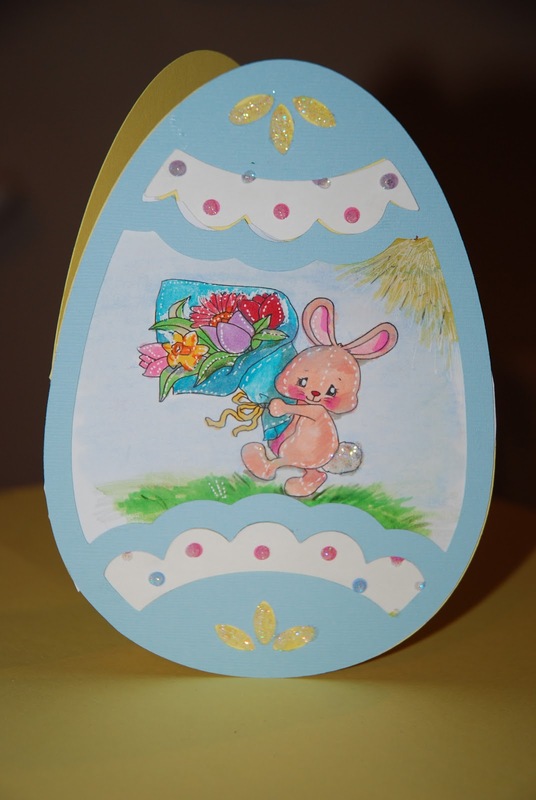 Awesome Easter card- I love all the embellishments you added to it- so cute! Nice card! Love the AP cart! Just so adorable, love the egg shape! TFS! Beautiful card. Love the colors and you have layered and colored supper. thanks for sharing. How cute. Love the shape and it's perfect for Easter. Thank you so much for being a part of the hop and I can't wait to see more shape cards from you. Just the cutest little card. Supper job. What a sweet card. Love your coloring. Adorable Love the stamp and it is so perfect with your shaped card !! How adorable is that cut little bunny. Hi there Ellen! You have made a very cute card and it makes me want to make some too!! :) I am busy right now making a 6x6 recipe scrapbook. so Until i get that done it is not going to happen LOL! I will be posting on my blog as I finish it! TFS!! Love your shaped Easter Egg card. I want the Art Philospy cartridge. Your card is great! I love how you incorporated the digi in the egg. Thanks for sharing.